My last Spring break in college, I wanted to do something fun. I knew after graduation life was going to get busy and I wouldn’t have a whole lot of time to myself. My friends were all planning awesome beach trips, and I came very close to attending. But I figured hey, I could drink beer on a beach when I am old. So instead I started to explore my Google Earth and plan an epic trip. The map above can be viewed and downloaded on Caltopo here. As with any trip of this caliber its never going to be perfect and on day one our trip we didn't even make it to the bottom of the Grand Canyon! We also had to add a small detour toward the end of our hike do to our water levels. Due to a small emergency on the second day of the hike, which I will speak about further down this post we had to spend an extra night in the Canyon At Bright Angel Camp Ground. 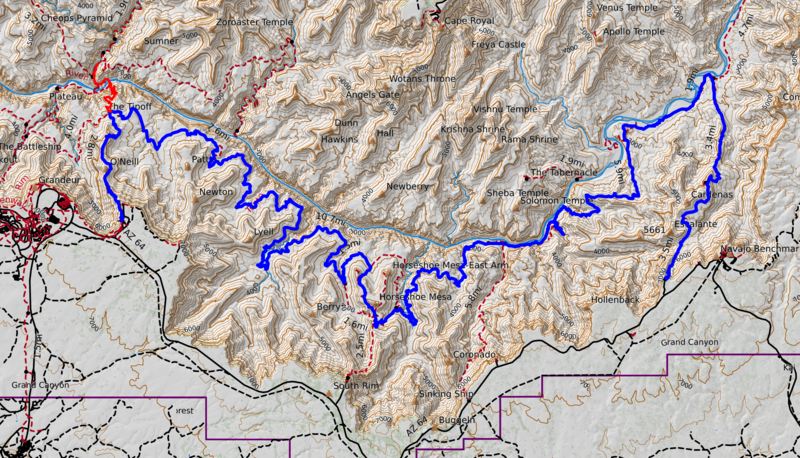 The "Detour" can be seen on my Caltopo mad as the red line toward the end. Day one, we drove into the Grand Canyon and parked at the main visitors center at the Canyon. Unfortunately, as you can see in the above maps, our hike starts at Lipan Point, which is nowhere near the visitors center…. 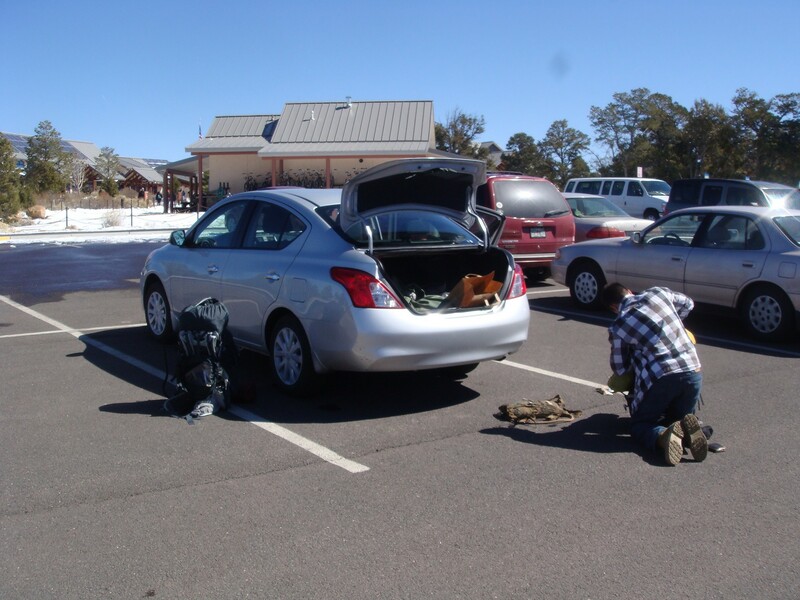 We also didn’t want to drive to Lipan point because we wanted our car at the end of the hike so we didn’t have to worry about “retrieving” our rental car when we were exhausted after a week in the Canyon hiking. 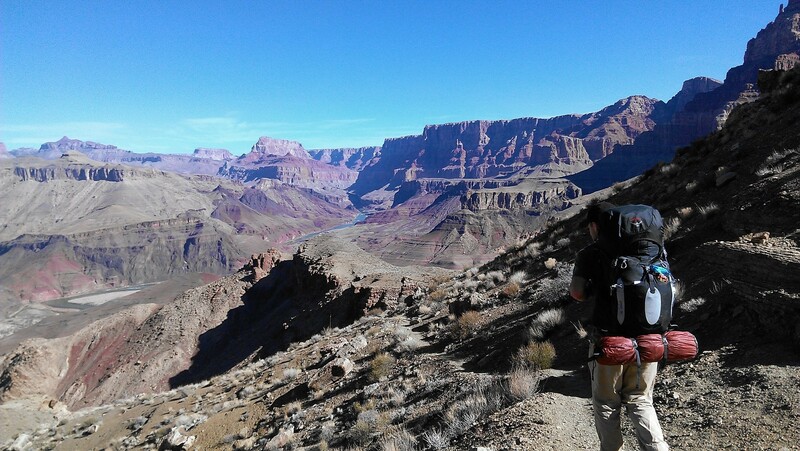 We asked a Park Ranger if a bus went to Lipan point… and the answer was no. There were people you could hire to drive you, but they were pretty pricey. 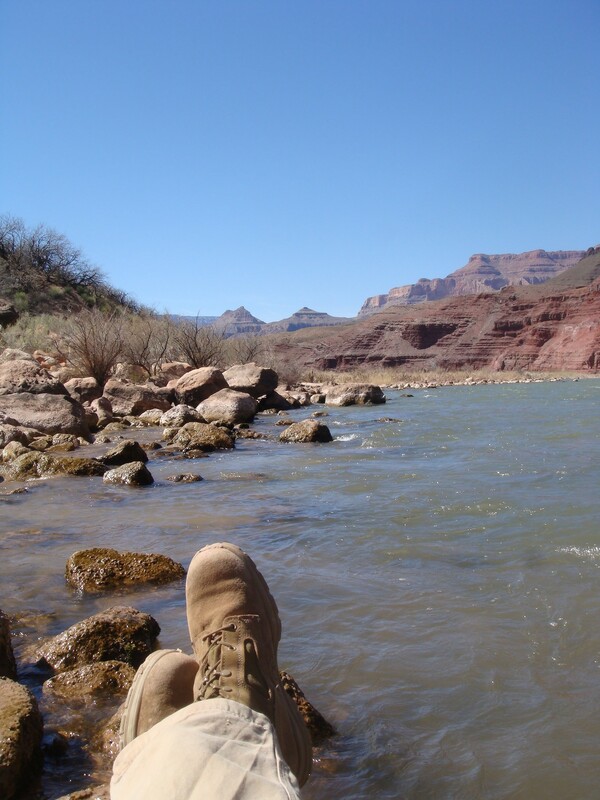 I won't say how we got there, but lets just fast forward to Lipan Point…. When we arrived at Lipan Point we had come a long long way to finally start this hike that was months in the planning. We had flown more than halfway across the country to Las Vegas, fought off the rental agency trying to rip us off on a car that was going to be sitting in a parking lot for a week, drove over 4 hours to the Canyon and managed to get all the way to Lipan Point! Our Hike was finally about to start! 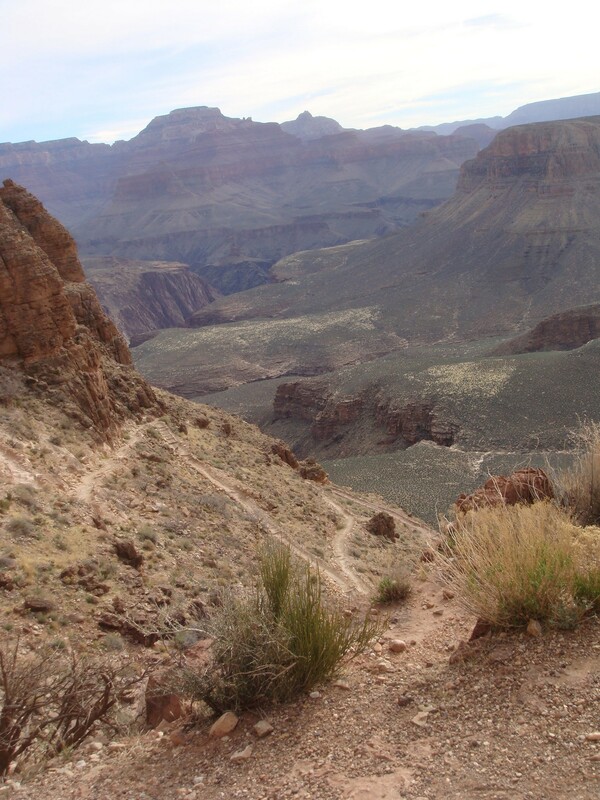 Once we got to Lipan Point, the trail wasn’t exactly easy to find, and we started off on what we thought was the trail but seemed to be just a short walk to a vantage point. 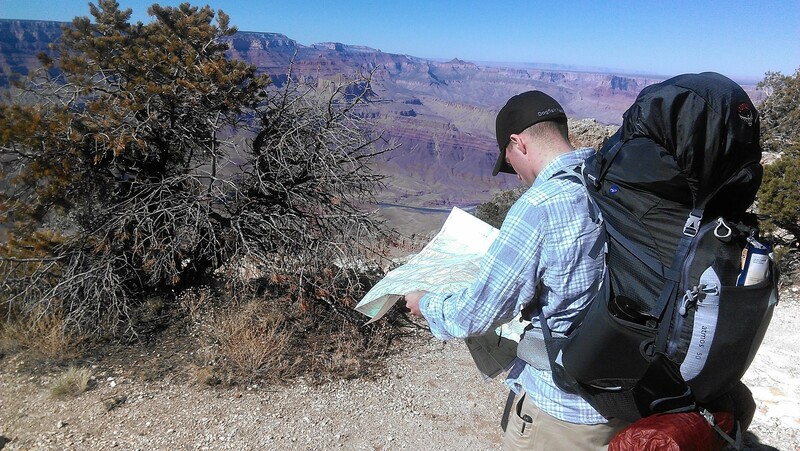 So we had to pull out the map to try and locate our first trail…. this was starting great. I never let anything get in my way or discourage me, I wasn’t about to change the entire hike because I couldn’t find our first trail. 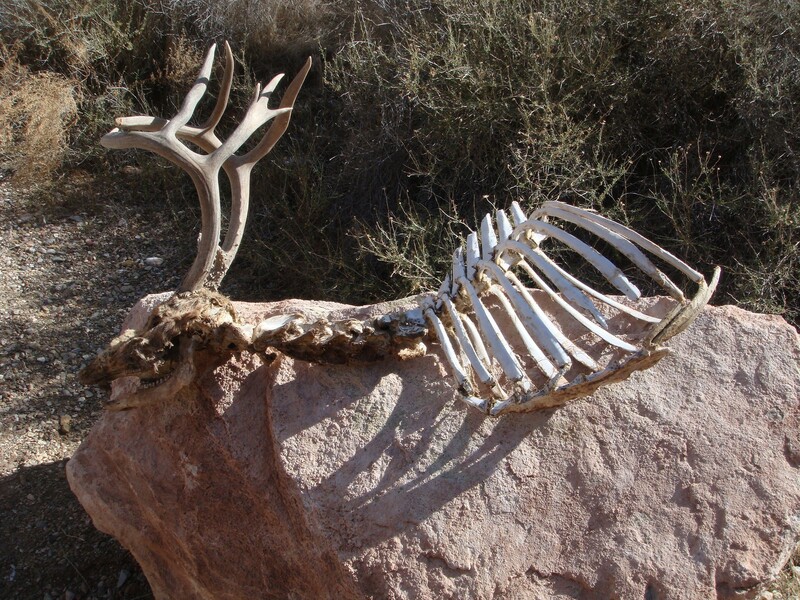 I knew where we were on the map, but the trail wasn’t marked well. Using terrain association I was able to figure out the direction we wanted to go, and I figured once we hit the Colorado River, we could get back on course easily. 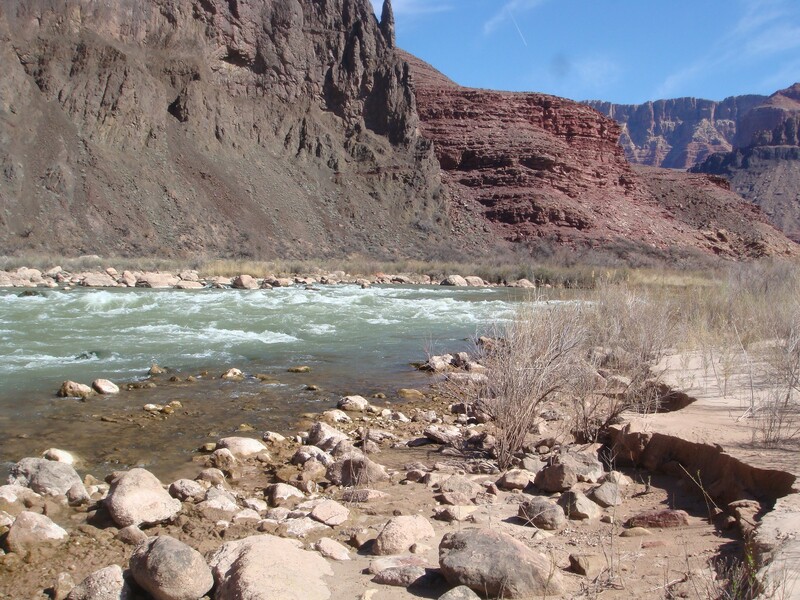 You can see from our Google Map above, that once we hit the Colorado River we just head west, so I figured we could use the Colorado River as a catching feature and I was confident we would not get lost….so we forged our own trail into the Grand Canyon. What a way to start an epic hike! To say the least, the first day of hiking was quite an adventure. 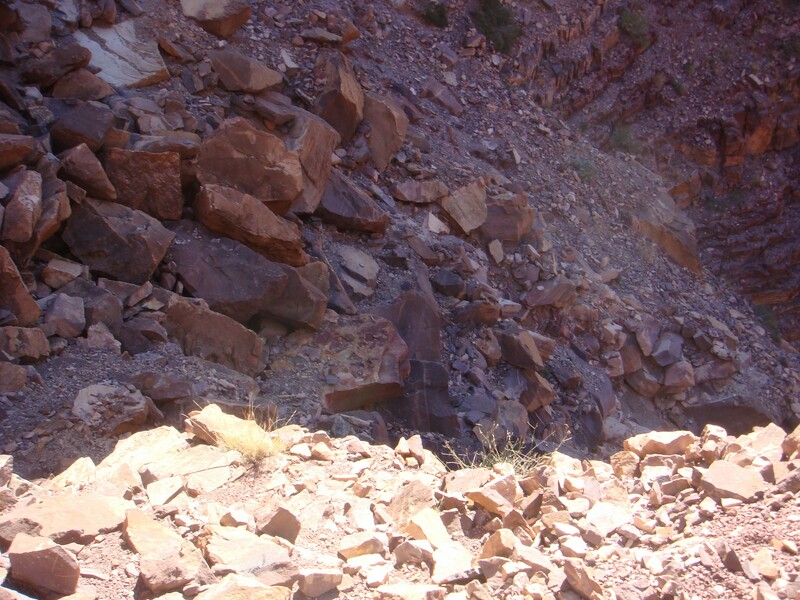 When you are not on switchbacks and you are forging your own way down to the bottom of the Canyon it gets a little steep… The pictures we took don’t even do it justice. 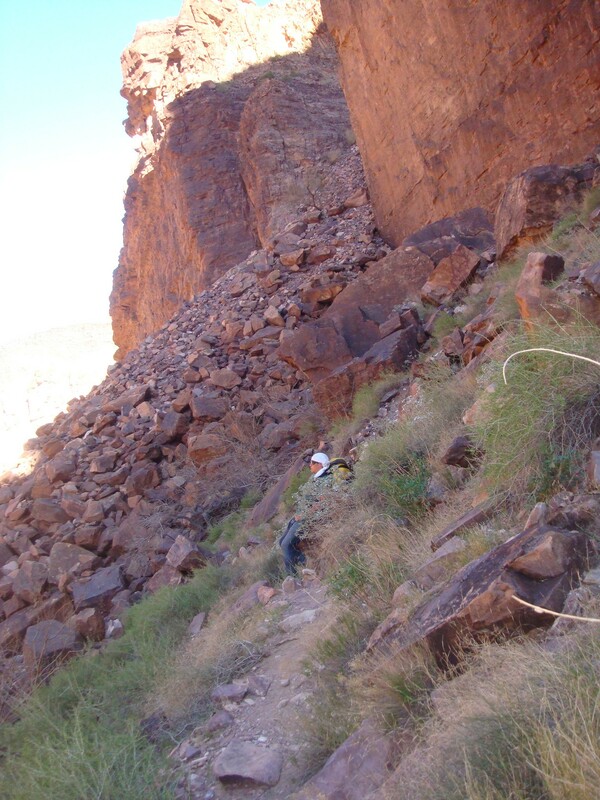 We may not have needed ropes but we were our hand and legs to “climb” down the canyon. 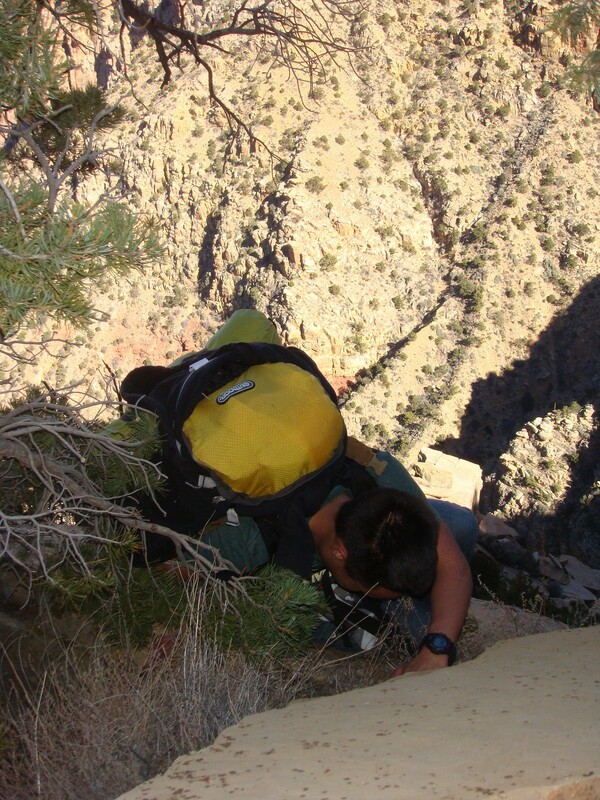 At one point it got a little to steep for my comfort level to “climb” down with my pack on my back. Basically, I needed balance and stability to get down this section of trail. So I took off my pack and literally dropped it down part of the Grand Canyon, gracefully I might add. The graceful drop of my pack for safety turned into our first minor hiccup of the trip. My strap to my pack broke… I do not blame this on the pack at all, it was totally my fault. I was hiking with an Osprey Atmos 50, and if you know anything about Osprey’s warranty you know why I was not to upset. I took some 550 cord that I had and easily “made” a strap that worked perfectly the rest of the hike. As mentioned earlier our we didn't make it all the way down the Grand Canyon due to a very late start. Blazing off the trail accidentally and having to more or less climb our way down greatly affected our speed on the first day. As we made it down we, eventually ran into what was supposed to be our trail! 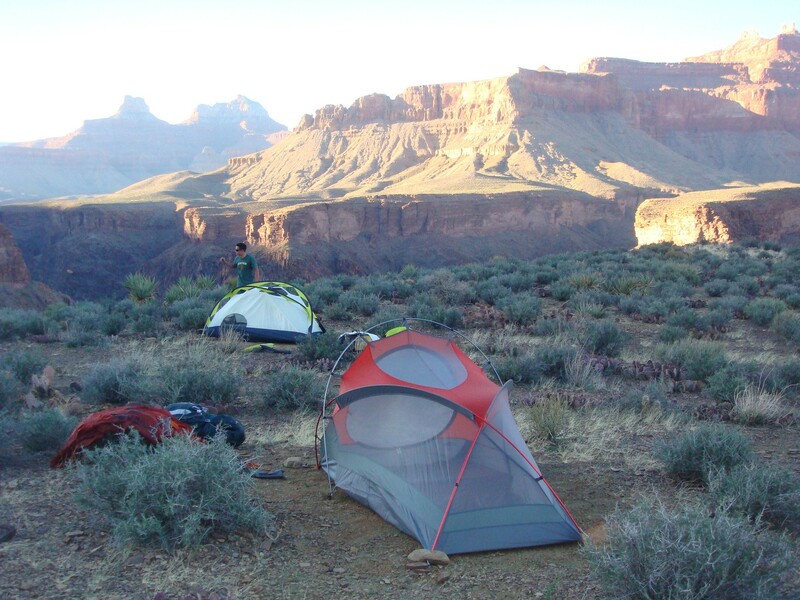 We eventually found some flat enough ground to pitch our tents, and we prepared to spend our first night in the Grand Canyon! 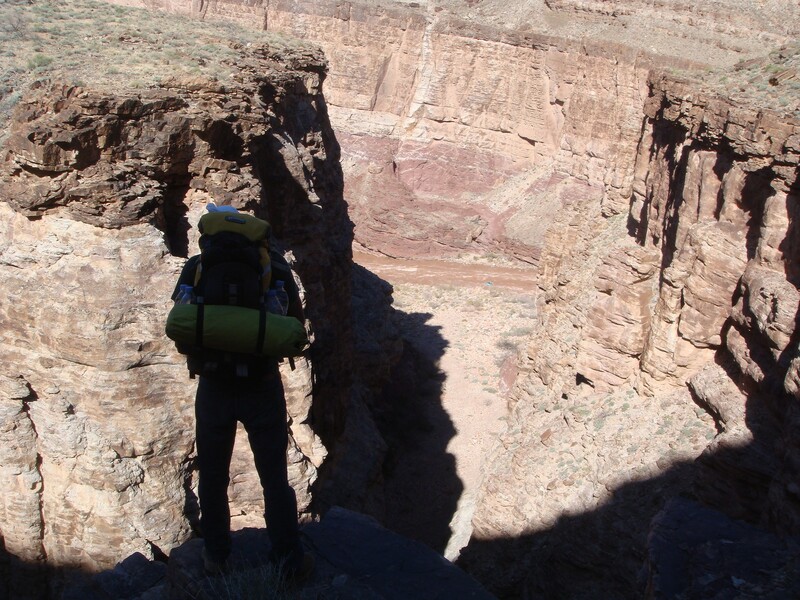 It was pretty neat to look back up behind us and see how far we had come down, but we still were not at the bottom of the massive Grand Canyon. I can't explain the feeling of the first night in the Grand Canyon wilderness, its when it first hit me how alone we really were. Off the grid away from everything it truly was an amazing experience, I almost couldn’t get to sleep. 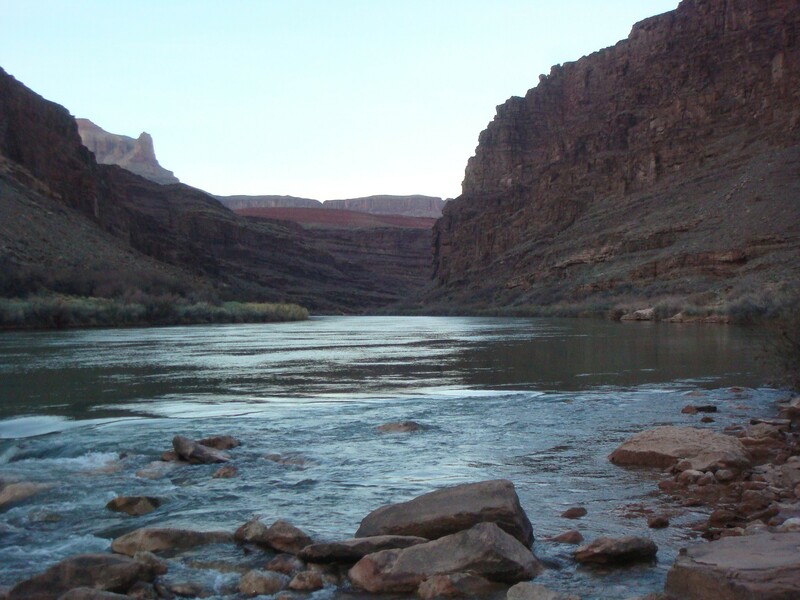 I absolutely could not wait to make it down to the Colorado River in the morning and see it in person. Plus it would be our first time to replenish our water supplies. 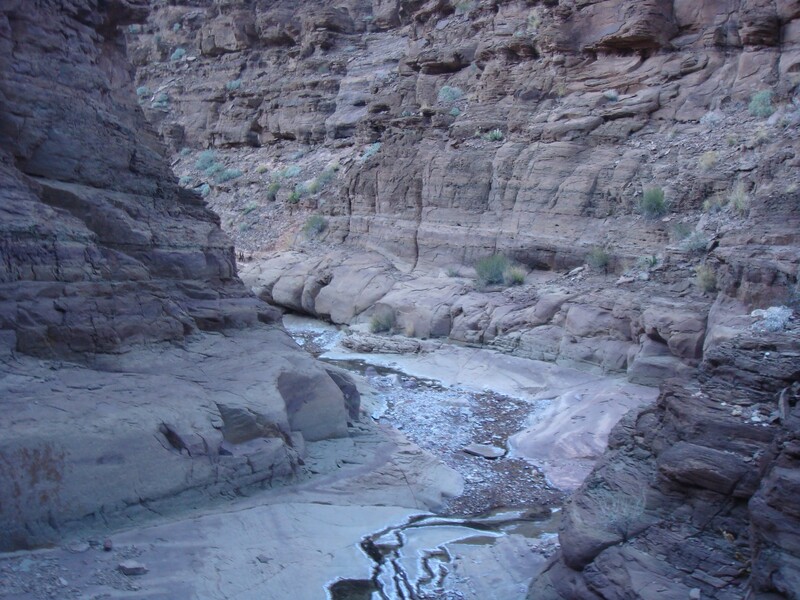 It was my first desert hiking experience and water was on my mind for pretty much the entirety of the trip, because I knew we were totally on our own out there. The second day, we were able to make much better time actually being on a trail and not climbing, I could see the Colorado River and I was stepping it out to make it to the bottom. I know I said the first night in the Grand Canyon was an amazing experience, but making it down to the Colorado River in person was another awesome achievement! I couldn’t believe we actually did it! I wasn’t thinking about the miles and miles of trails ahead of us, I just stood there stunned at the beauty of the flowing Colorado, which had carved out the Grand Canyon. It was literally mind-blowing! The water at this point up the Canyon was pretty clean and blue for the most part. It looked magical almost! After admiring the beauty it was time to top up on water. We were not near empty but hiking through the desert we thought it a good idea to top off all our water bottles and Camelbacks any time we had a chance. For this hike, I brought along an MSR MiniWorks but had its ups and downs which I will describe in detail in a little bit. 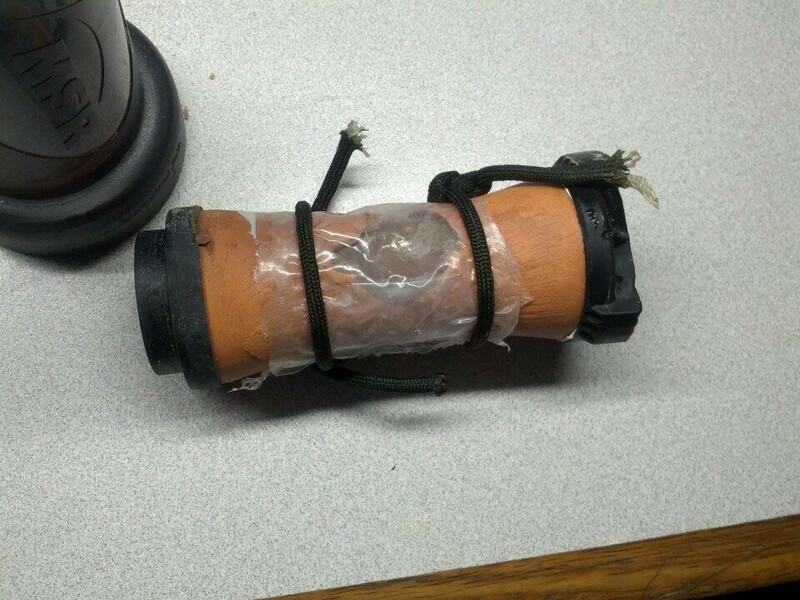 The water filter is very small and easy to pack, it screws on top of a Nalgene water bottle. Once screwed on you throw this tube into the water source and start pumping, as you pump the water come up the tube, goes through the filter and falls into your Nalgene. Drinking water filtered from the Colorado River was pretty neat. After purifying it through the filter, it tasted super cool and crisp. It was extremely refreshing! 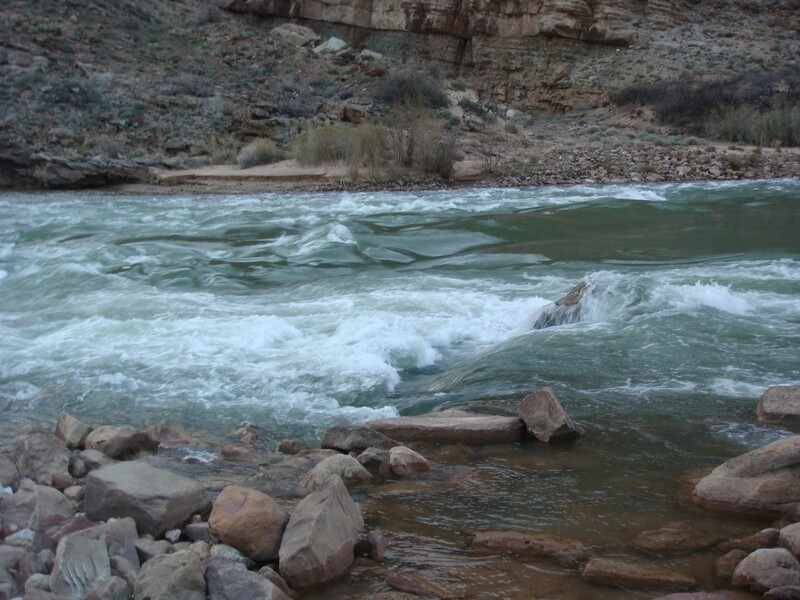 Did I mention how cool it is to just chill at the Colorado River, with nothing or anyone else near you! Now that we hit the river, and we were actually on trail things were looking great. We were underway on an amazing adventure! 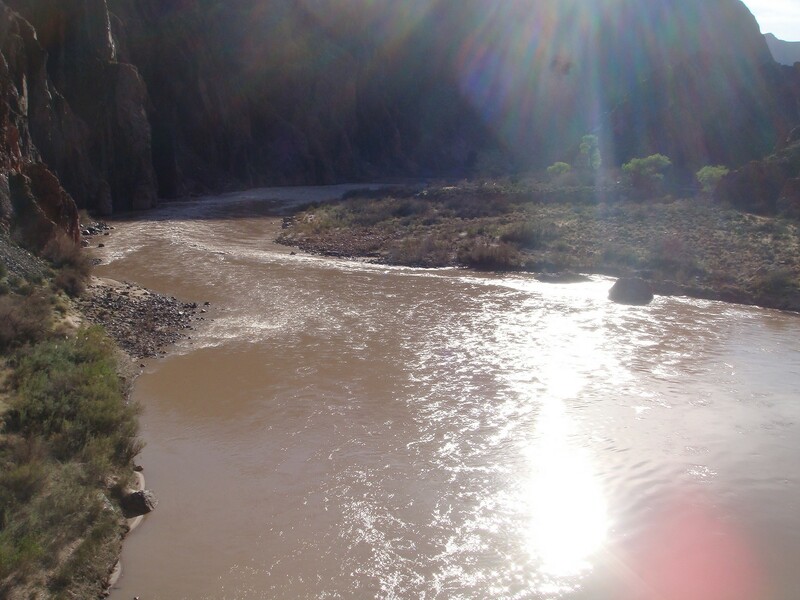 At the point, we turned generally west and followed the trail that “hugged” the Colorado River. As we headed west it was more or less flat compared to what we were dealing with coming down into the canyon. It was remote and gorgeous with amazing views in every direction. 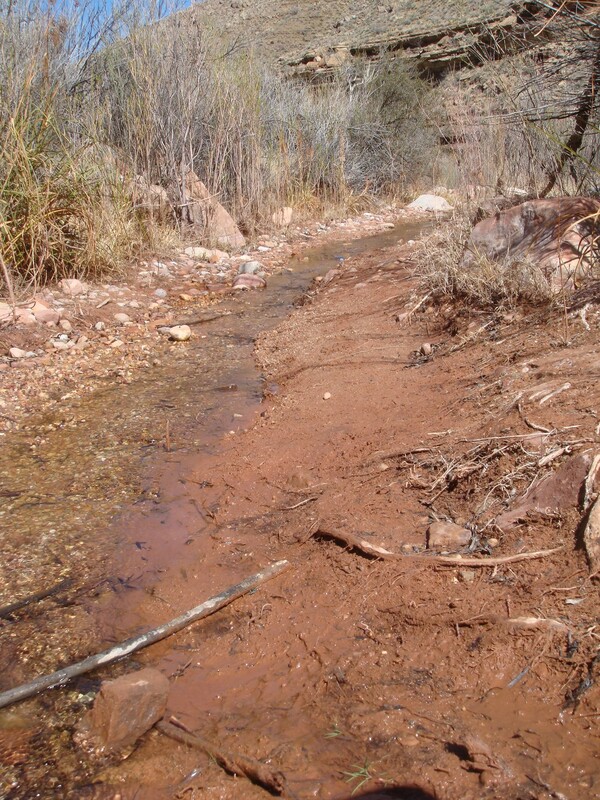 The trail did not hug the Colorado River the entire way. For this segment of the hike, we went in and out of different deep valleys which brought us away from the river, bringing us back and forth. As darkness started creeping up we started to look for a place to settle down and set up our tents before it got too dark. 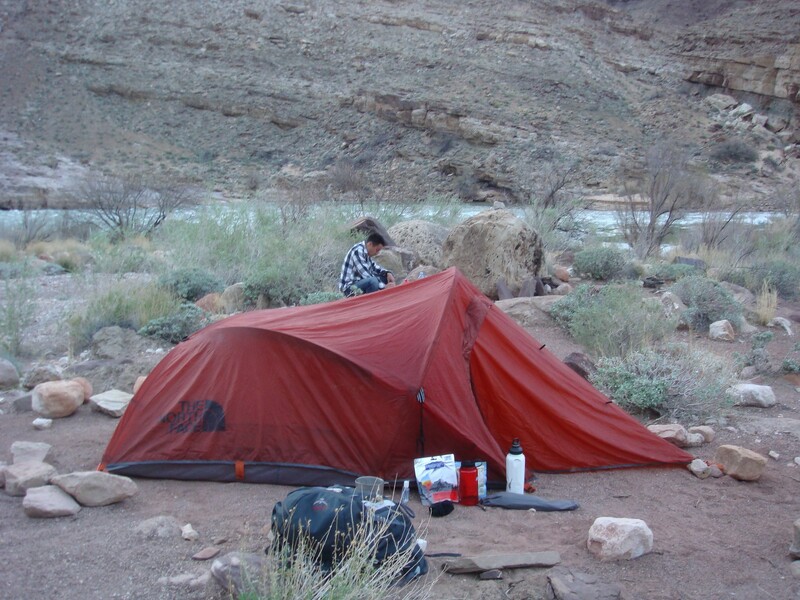 Just as luck would have it, at the end of one of the canyons we came back out near the Colorado River and got to camp next to it! Other than the amazing views, and location of this campsite, we also had an awesome natural table for dinner! The next morning we were off on the trail again. Throughout this trip, we didn’t really eat much of a breakfast just a few quick snacks. We packed up our gear and got on the trail when it heated up by midday we would take a break and cook lunch. 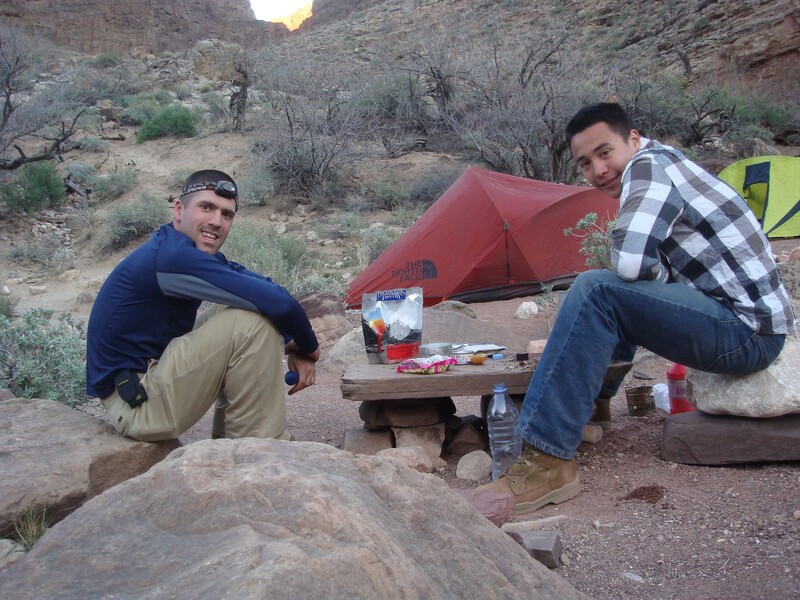 After lunch, we would continue to hike until dusk, which is when we set up camp and cooked dinner. That was more or less how each day went. So with water supplies dwindling and, no idea where we can find fresh non-silty water, it became time to engineer our way out of this. Despite the turn of events, we pushed on… I guess we didn’t really have any other options. As the hike moved on, the trail moved up onto the cliffs bordering the river. 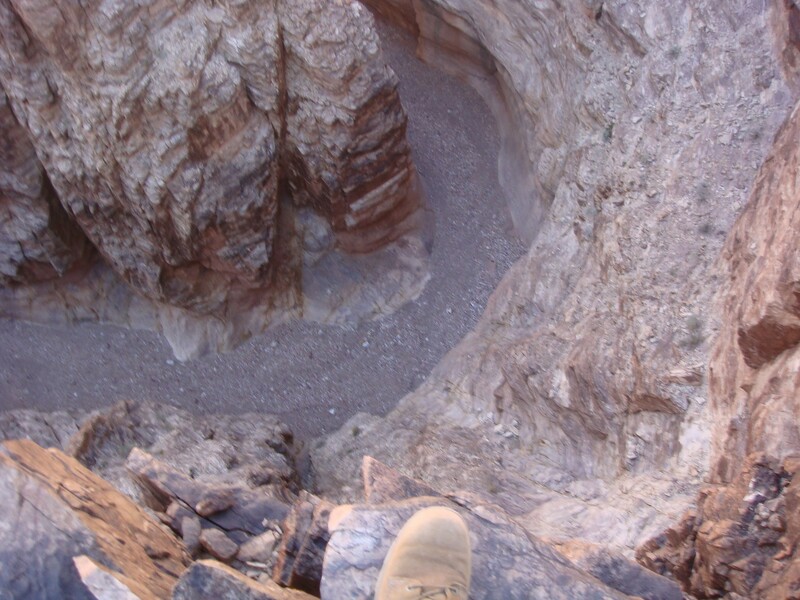 This brought us some awesome sweeping views of the Colorado River below, and of the Grand Canyon as a whole. The trail also was pretty close to the edge, so if your afraid of heights your knees might knock a little during this portion. After being on the edge in the above pictures, you get the pleasure to walk through these mini micro canyons in the Grand Canyon. Toward the end of this day, we had one more challenge to conquer before we completed the hike. We had to boulder down what looked like a rock landslide. The next few pictures don’t do this justice, it was very interesting to climb down. Remember being low on water and not having a water filter… well, we tried a whole bunch of ways to work around this. I tried using my Under Armour to filter out some of the silt, this worked to a limited degree but not as much as I would like for drinking purposes. I then tried a two-stage attempt, I “filtered” the silt through my Under Armour, and then let it sit in my Nalgene overnight to let the rest of the silt settle to the bottom with gravity doing its work as I slept. This worked a little better but it was just not enough to fill the gap with how much water we were drinking. Basically, we could drink the top portion of this safely…. As we hiked on and on, water was becoming low, and we couldn’t filter as quickly as we would like to sustain normal operation levels. But god thankfully answered our prayers and we stumbled onto this beautiful thing! I know, I know the mud doesn’t exactly look that pretty, but boy was this a beautiful site! Yes, there was a lot of mud but the water running into it was clear and clean. Just to be safe, we did boil the water before drinking. I did not want to get sick with so much of the hike to go. This little stream was a godsend! Each night after this we scrutinized over our map to look for possible freshwater sources that could be cleaner than the Colorado River. This source really revitalized us and raised morale! As we pushed on we made it another night and had water to continue, again we boiled it just to be on the safe side. Despite the scarcity of water, we were pretty calm throughout this entire trip. 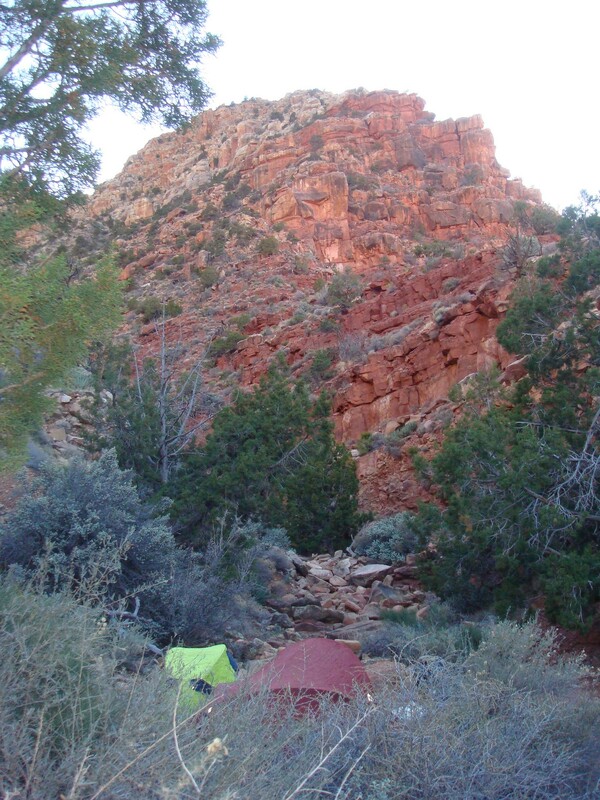 One thing I could never get over while hiking through the canyon was the solitude and beauty of every place we set up camp for the night, again the pictures just don’t do this justice! With all the beauty through you can't let the few negative images get you down when you are low on water…. At this moment in the hike, we had planned to be hiking up and out of the Canyon and bringing the trip to an end. 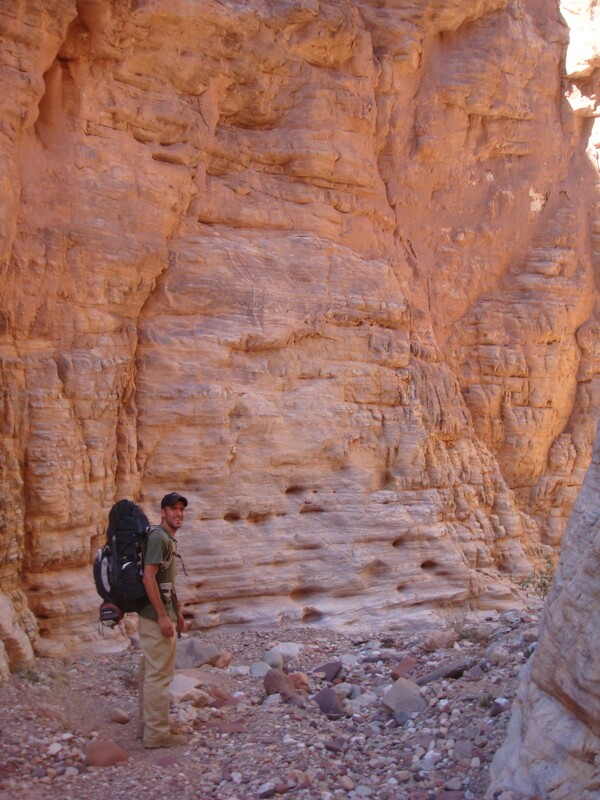 Despite the difficult hike into the Canyon, it was more technically difficult than challenging on the body. 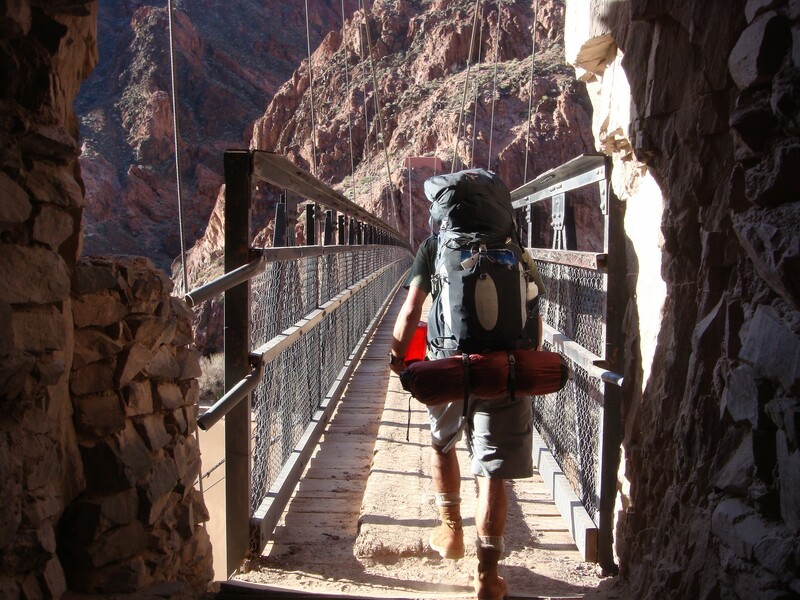 The hike out of the Canyon would be an entirely different beast, it would be physically demanding and exhausting, we would need to be at 100% water capacity before starting this final challenge. After analyzing the map the only guaranteed fresh water we could pinpoint was down at Bright Angel Campground at the very bottom of the canyon. Up until this point in the of the trip, we had been backpacking through what is called the wilderness or backcountry. In this section of the state park we can camp anywhere, make your own campground, but at Bright Angel Campground at the bottom, this would be the first time we would see a lot of people. 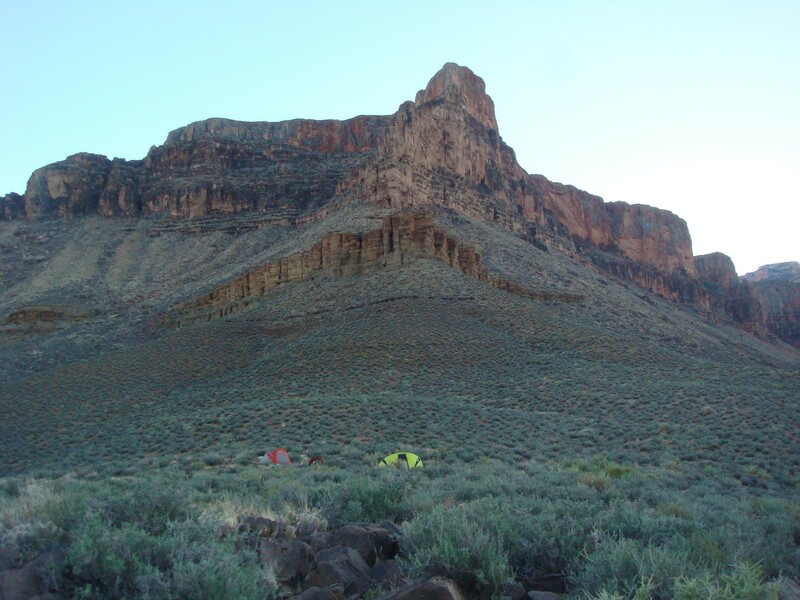 The one issue was since it is an established campsite you needed reservations….which we did not have. 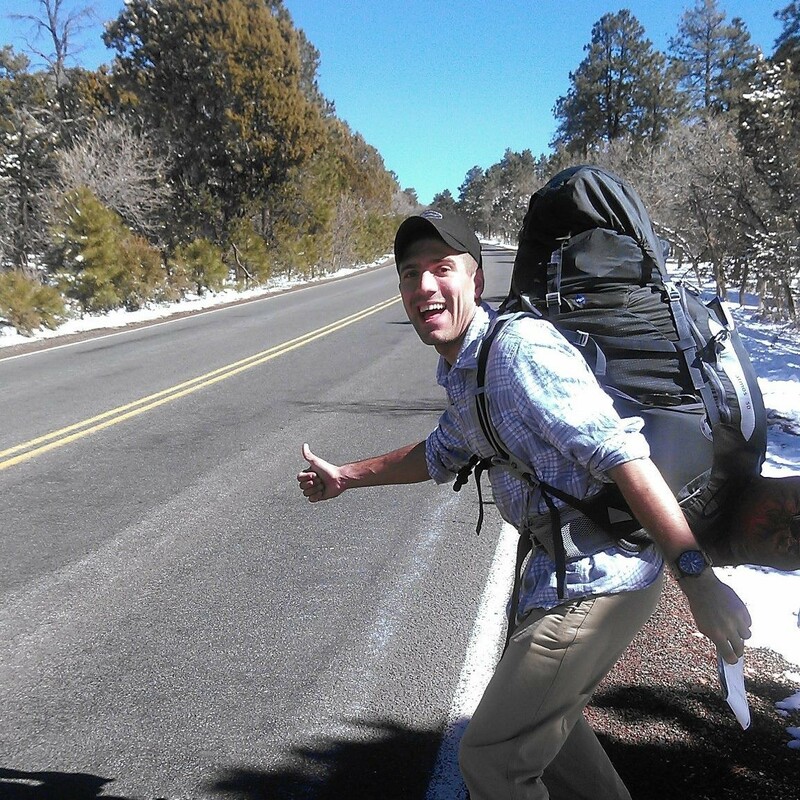 Despite not having reservations we doubted the park rangers would turn away two thirsty, and tired backpackers. If you scroll all the way back up to the top of this post and re-look at that yellow line on the map, that is the detour we took down to Bright Angel Campground. As a result, we hiked back further down to the very bottom of the Canyon and got to cross an awesome bridge over the Colorado River. When we got to Bright Angel campground, we were right. The park Rangers were friendly and helped us out once we told them our situation with the broken water filter. Down at the campground they had some plumbing with fresh water out of a spicket! This was the first real infrastructure we had seen in days and it was amazing! We drank a whole lot of water! After filling up on water and spending the night near other people at a dedicated campground we were refreshed and ready for the hike, from the very bottom to the very top of the Grand Canyon! The hike up after days hiking was exhausting and challenging. To sum it up we were pretty tired. As you can see we had plenty of switchback and plenty of great views. When we reached the top though, it was all smiles despite being exhausted. The feeling of accomplishment was one like no other. We successfully navigated our way through a huge chunk of the Grand Canyon and we kept calm and made it through despite breaking our water filter early on in our adventure. If you ever get the chance to venture down to the Grand Canyon, I highly recommend it. If you have any questions on planning a trip, let me know in the comments below!